During my days planning my new three months trip to South East Asia, Sri Lanka quickly became a must visit country. With the stories of whale and dolphin watching, snorkeling in coral reefs and going on a safari and see wild elephants, Sri Lanka sounded like paradise. It’s not without reason that Sri Lanka is becoming more popular and therefore now it’s the time to visit this beautiful country (before tourism completely takes over). So on the second day of October we jumped in a plane ready for our three weeks adventure to the beautiful island Sri Lanka. During this time we did the most famous route to Sri Lanka, but then the other way around. This means that we started in the south of the island and did the world famous train ride from Ella to Kandy instead of Kandy to Ella. We decided to do this to avoid big crowds in this train ride between. What we didn’t realize was that there was almost no tourism when we were in October. I think to do it the other way is the best plan in the most touristy months of Sri Lanka. When we arrived at the airport, we were pretty destroyed by the long travel all the way from the Netherlands. Luckily, Negombo is a nice place to relax a bit before you start your journey in Sri Lanka. With the hostels only 15 minutes away from the airport, you will start your trip easily. The first night we stayed at Trip ‘n Chill hostel, which was really quiet but very nice. The night before we left Sri Lanka we stayed at Hangover hostel. This is a more social hostel with perfect beds (very private) and a great vibe. The first day in Negombo we went to the beach, which was interesting because the locals were fascinated seeing western people in swimsuits which lead to a lot of photo’s and giggles. You will see that around the more touristy beaches it won’t be a problem walking around in your swimwear. 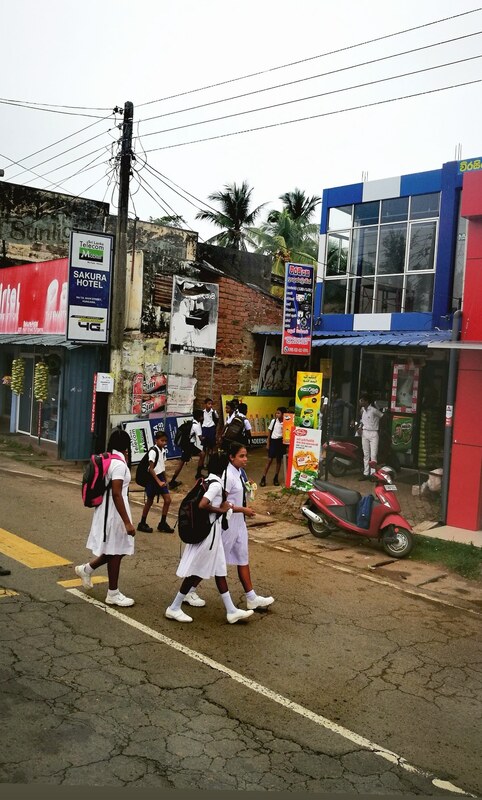 Another thing we’ve done during our time in Negombo was shopping in the main street. This was fun but you have to be able to deal with all the tuktuk drivers wanting something from you. After a day in Negombo we decided to go to the south of Sri Lanka. We made a good deal with a cab driver who drove us from the airport to the hostel, so we step into his car and started the 3,5 hour drive. We immediately were overwhelmed by how incredibly green Sri Lanka is. There are literally palm trees everywhere! In Unawatuna we stayed at the Rockstel Hostel, which is literally in the middle of the jungle. The minute we walked in the hostel garden, we saw the monkeys flying around in the trees around the hostel. Of course we went straight to the beach. This was our first moment engaging with the public way of traveling. 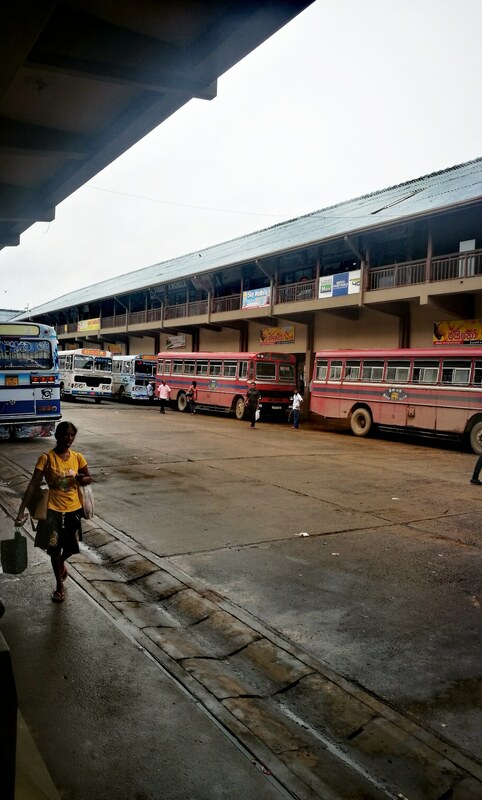 For almost nothing you can travel to almost everywhere in Sri Lanka in the crazy colourful public busses. Those busses are really the king of the road here, they will drive like crazy, the local music plays crazily loud and after school times the busses are stuffed with school kids, but this will all add more fun to your ride. We went to the beach where many backpackers trying to learn how to surf (north of Unawatuna). We picked a beach bar, ordered our first local beer and enjoyed the view and sunset: the perfect start of our Sri Lanka adventure! The day after we went to the beach in the south, which has a more beautiful and wider beach and therefore is the best beach to be at if you want to relax and swim. How cool are the public busses? Close to Unawatuna (we kept saying Hakuna Matata because we couldn’t remember the name) is Galle city with its fort. By public bus it will take you around 20 minutes to get to the fort. It’s a beautiful little area to walk around for half a morning, learning more about the history. A definite must is walking around on the fortress walls. It is quite touristy so the prices for souvenirs and food will be a bit higher. The plus side of a touristy place is that you will find a lot of cute cafes where you can grab some food and coffee. After exploring Unawatuna and Galle it was time to take a short trip (two public busses) to our next destination: Mirissa. We stayed at Mister Hostel which is an easy going, but social hostel close to the beach. Every night around sunset we saw thousands of massive fruit bats flying in the sky; beautiful and scary at the same time! The street to the beach is a cute sandy road with some really nice restaurants. In Mirissa I fell in love with the Sri Lankan dish Kottu (Kothu Roti), to me it’s the ultimate comfort food. Kottu’s ingredients are sliced roti, vegetables, eggs and if you want, a choice of meat and/or fish. Our favourite dinner place was a little cafe in this street, look for the place where the walls are signed by all the visitors from all over the world. The beach in Mirissa is my absolute favourite during my three weeks in Sri Lanka. The waves are incredible, you’ll see very experienced surfers catching the waves (or trying to, very fun to watch). You have plenty of beach bars for drinks (the freshest fruit juices you’ll ever drink), lunch and dinners; don’t miss out on some fresh fish. You can rent cheap body boards by the hour at some bars: fun times guaranteed (and a good work out)! At night there is always a beach bar to go for a couple of drinks and have fun. When you search for Mirissa on the internet you will find the photo of the palm trees on top of a small hill, known as Coconut Tree Hill. Of course we were curious to visit this beautiful place and in only twenty minutes you can walk from the beach to Coconut Tree Hill where you can enjoy the wind in your hair and the beautiful ocean view. Have you really been in Sri Lanka when you didn’t (try to) surf? Don’t think so ;). Tourism in Sri Lanka got as popular as it is because it has one of the best beaches in the world to learn how to surf. The waves are not too high and they are long which gives you plenty of time to get up on your board and find your balance. Of course we wanted to try to learn to surf as well. Since the waves were too high at Mirissa beach we decided to take lessons close to Mirissa, at the beach of Weligama. We paid around 12,5 euro (14 dollar) for a three hour class. I would definitely recommend doing this at least once in Sri Lanka! We had so much fun and all three of us were able to catch some waves while standing on our boards. Hunger guaranteed after your surf work out, but luckily Weligama has multiple nice food spots to grab some lunch. After spending a week around the beautiful beaches of Sri Lanka it was time for a change. We travelled around 6 hours (two public busses and a tuktuk) to Udawalawe which is a tiny place in the heart of a incredible green area of Sri Lanka. The reason we travelled to this place was to visit Udawalawe National Park in the hope that we would spot some wild elephants! Besides this safari there is not much to do around here. We stayed in a cute little homestay with an amazing breakfast (the roti with coconut sambal and red lentil dahl plus the fresh fruits in Sri Lanka are to die for). In the early morning we jumped into a big jeep and started our morning safari. The whole adventure was amazing, the national park itself is already beautiful and we spotted so many wildlife: birds, crocodiles, buffaloes, monkeys and of course a couple of shy little elephants! This safari was a big realisation for us that Sri Lanka has so many different faces, all so beautiful to discover. In my second and third part of my Sri Lanka guide I will write about the other half of my time in Sri Lanka: the beautiful surroundings around Ella, including the famous Nine Arch bridge (read about my travel guide to Ella here). The beautiful train ride from Ella to Kandy (with a stop in between to hike Adam’s Peak), the incredible sunrise at Sigiriya (Lion Rock) and another beautiful beach experience, including spotting over 2000 dolphins, in Trincomalee. Soon online! Definitely do, it feels like Paradise!